Amy Grant and Vince Gill have announced plans to host an evening of music at The John F. Kennedy Center for the Performing Arts in Washington, DC, on Monday, June 8 at 8 PM, honoring wounded warriors and launching the nationwide Challenge America initiative. 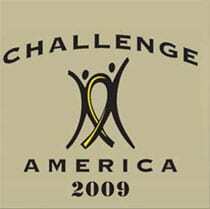 Challenge America — an outgrowth of Challenge Aspen, a non-profit organization that has provided adaptive recreation for people with disabilities since 1995 — will work with communities to support the development of recreational and occupational programs for returning injured military and their families. Musical guests slated to join Grant and Gill at the Kennedy Center launch event include Michael McDonald, Alison Krauss, Darius Rucker, Melinda Doolittle and Mac McAnally, with bestselling author Stephen Mansfield. Tickets go on sale Saturday, May 2, and are priced at $50, $75 and $95 for general admission and $500 for Gold Circle Seating to include a post-show reception. Tickets are available at the Kennedy Center Box Office, via InstantCharge by calling (202) 467-4600, and online here.